IGN has the first 24 minutes with commentary by Anthony Burch up. I ABSOLUTELY LOVE the idea that the game will change depending on Dungeon Master Tiny Tina's whims, and the fact tat now each small comment by the Vault Hunter will be character specific to who you're playing as. Nice touch. So are the Dice roll chests- being a new use for eridium-giving you a higher chance for good loot items. Any characters can show up (Including dead ones) because it's all in Tina's imagination. That is super amazing, and opens up infinite new avenues of storytelling on Pandora. Damn, I'm excited for this. Thank god this comes out after I gradute (on June 15th is my last day and then I'll be a gold-starred, fancy-papered degree holder), and this would probably lure me in and I wouldn't be able to tear myself away to finish finals. After watching this, I have a very strong feeling that this may end on a somber note. (Spoilers ahead). In the opening of the new pack, Tina asks were Roland is, and the other (former) Vault Hunters look around like "Who's gonna tell her? "; clearly Tina is either unaware or in denial. Just based on the art in a previous post (the "Army of Darkness" inspired cover) we see that Roland has returned as a character. My guess is at some point Tina's is going to learn or come to terms with his death and we'll see it played out in the fantasy. 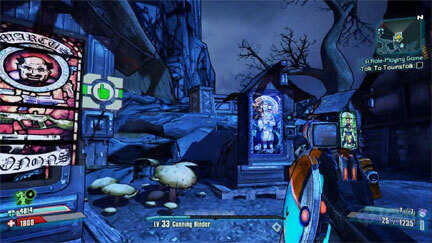 Now don't get me wrong; based on what we see in the playthrough this still looks hilarious (Torgue returns! ), but I can't help but shake the feeling that there's going to be a pretty dark point in this story. Hell yeah! It's all about coming to terms with the last of what she considered family- coping with death. Pretty sure there's gonna be some warped versions of previous characters because she views them differently. How will she see Handsome Jack? A deformed monster? Probably. Makes me wonder what kind of moments will be there that are as emotionally moving as much as something like Bloodwing's death. I personally felt that was more moving than Roland's. I just hope Tina's Torgue is every bit as awesome as he is in "real life." Tina's Torgue = just as awesome!